French Lick Resort, long one of America's premier resort destinations, is situated on rolling hills overlooking the Hoosier National Forest in southern Indiana. The historic resort is located in the small town of French Lick, where, for over two centuries, the Pluto Mineral Springs has attracted visitors. (It is also known as the hometown of basketball legend Larry Bird.) French Lick is now the only resort in the world that combines the classic history of Donald Ross and the modern-day design of the legendary Pete Dye. This combination is a spectacular opportunity for golfers to experience two of the best designers who ever shaped beautiful landscapes into golf courses. 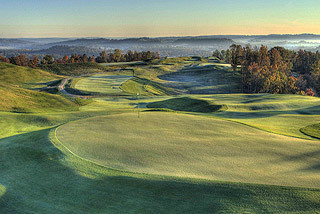 For stay and play golf packages at French Lick Resort, click on this link: https://www.frenchlick.com/golf/packages. 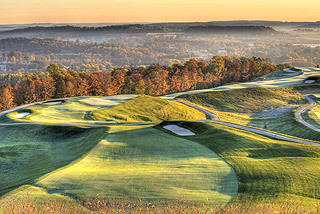 The 8,100-yard Pete Dye Course at French Lick Resort is etched into Indiana's 2nd highest elevation point. When Pete Dye initially walked the proposed building site for the course, he concluded that there was no way to build a golf course on that land due to the severity of the rugged, sloping terrain. 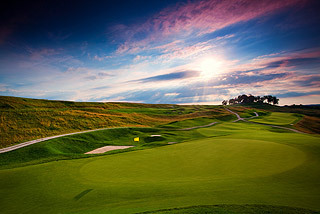 The course officially opened in the spring of 2009 and held its first major PGA event by the summer of 2010. 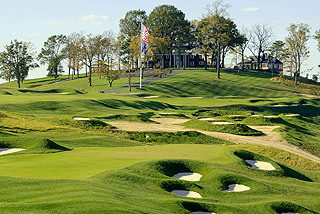 Recipient of the 2017 National Golf Course Owners Association (NGCOA) Golf Course of the Year, the Dye Course has become a popular venue for championships - including the host course for this year for the first ever seniors women's major, The Senior LPGA Championship presented by Old National Bank. Other major events have included the 1010 PGA of America's Professionals National Championship, the Big Ten Men's and Women's Championships in 2012, 2013 and 2014, the Indiana Open in 2012, the USGA Men's Team Championship, the LPGA Legends Championships in 2013, 2014, 2015 and 2016, and the 2015 Senior PGA Championship presented by KitchenAid. The Pete Dye Course features 5 sets of tees that play to distances measuring 8102 yards with a course rating of 80.0 and a slope of 148, 7254 yards/76.2 rating /139 slope, 6701 yards /73.2 rating/135 slope, 6115 yards/70.6 rating/130 slope, and 5151 yards with a course rating of 65.4 and a slope of 118. The slope ratings for women are 130 and 120 from the two front tee areas. Besides the Po Link GPS which provides accurate info from tee to pin, golfers can rely on yardage markers at 100, 150 and 200 yards that are posted on the fairways. This long 18 hole, par 72 layout features four 500 yard par 4s, including the 519 yard first hole. Most tee boxes and greens are elevated, and the fairways are sloping and mounded causing difficult landing zones and uneven lies. 156 bunkers come into play along the fairways and greenside challenging golfers from the tee and on approach. Water comes into play on the first, 10th and 16, and there are no forced carries anywhere on the course. This revered championship layout features immaculately maintained fairways and rugged, intense terrain. 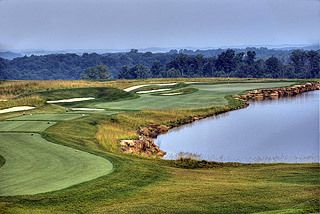 The course has gained national acclaim for its 40-mile panoramic views of the southern Indiana countryside, three man-made lakes, "volcano" bunkers and a variety of elevation changes. A robust 8,100 yards from the professional tees punctuate Dye's signature sting from vista-to-vista. The golf facilities include two 18-hole championship courses with adjacent putting/chipping greens, and the nine hole Valley Links course. The Valley Links Golf and Activities Center on resort property features a beautiful 9-hole resort course, an indoor putting green, a 10-station indoor driving range, an outdoor practice putting green and an outdoor driving range. The Dye course's clubhouse stands at 1,000 feet above sea level and is a turn of the last century mansion built by Thomas Taggart, former owner of French Lick Springs Hotel, Mayor of Indianapolis and one-time chairman of the National Democratic Party. Impeccably restored and decorated in painstaking detail, The Mansion is available for lodging and the carriage house now serves as the pro shop. French Lick Resort underwent a massive restoration project, to the tune of 382 million dollars - and together with the nearby West Baden Hotel provides visitors with choices of accommodations at two first class facilities, with features such as full service spas, a spacious casino, fine and casual dining, workout and meeting/conference facilities, swimming pools, and many more upscale amenities. For more info on French Lick Resort click here, For more info on the West Baden Hotel click here. 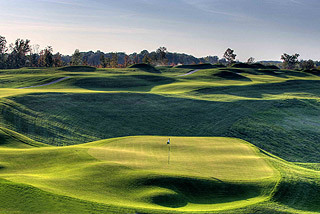 *Twoguyswhogolf note: Our photographer said that if he could spend the day playing golf at any resort in the country - he would prefer to spend it at French Lick - playing the Dye and Ross courses! We thought you might be interested in this quote from Pete Dye "I have spent the past five decades designing golf courses all over the world, including courses on great coastal sites," Dye explained. 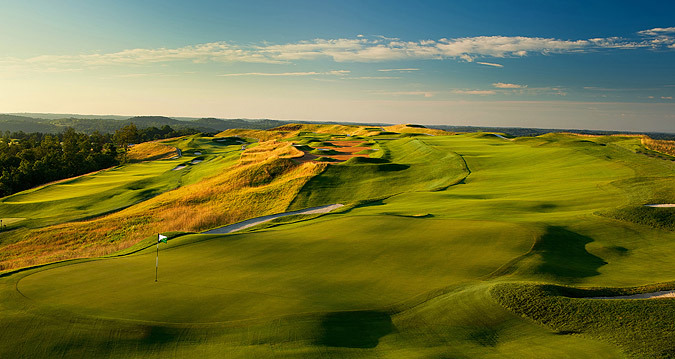 "This project at French Lick Resort has brought great excitement to Alice and me because the course is on arguably the best inland site I have ever worked on."